Let me give a basic idea about superchargers & turbo before proceeding to the differences. Superchargers and Turbochargers are known as forced induction systems where air is forcefully pushed into the cylinder of the engine to increase the efficiency ! 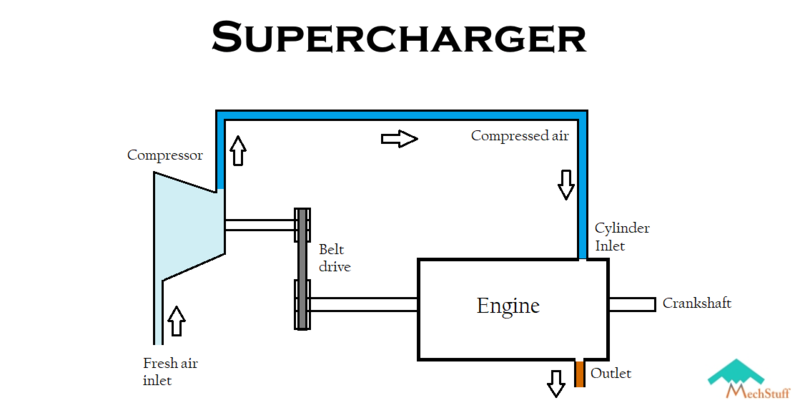 Diagram showing working of superchargers used in automobiles. In simple words, superchargers are pressure boosting devices which supplies air at high pressure to the engine. It is driven by the engine itself & power is transmitted via a friction belt to the device. The power is utilised by the the device(compressor) to compress the air & then delivers the pressurised air to the engine via intake manifold. Various types of supercharger such as centrifugal type, root’s type & vane type are available in the market. Application of these types depend upon the requirement of the pressure and available space to be installed. 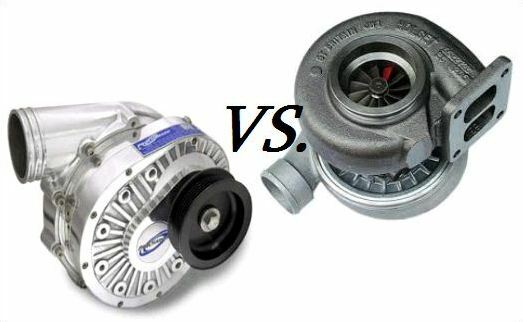 Turbochargers have the same function of a supercharger except that they don’t draw power from the engine. Turbochargers get their power from exhaust gases. The engine produces huge amount of exhaust gases carrying enormous heat energy. This energy usually gets wasted since they are released directly to atmosphere. Turbochargers utilise this energy by letting the exhaust gases pass through a turbine ! The turbine produces work which drives a compressor. The compressor then compresses air & supplies it to the engine at high pressure. Simple ! Superchargers are basically compressors. 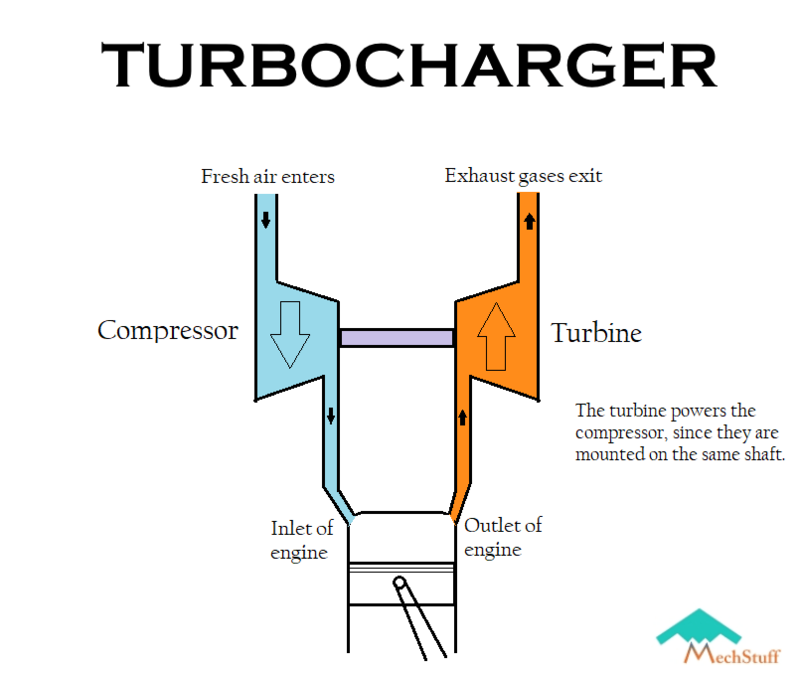 Turbos are devices consisting both- turbine & a compressor mounted on same shaft. Extra power is to be supplied. Doesn't need extra power. They draw power from engine. They extract their power from the exhaust gases. They are connected to the intake manifold of the vehicle. Since they are a combination of turbine & a compressor, the turbine is connected to exhaust pipe while compressor to intake. Suitable for engines with smaller displacements. Suitable for engines with higher displacements. Superchargers start working as soon as the engine starts. Turbos won't start operating until sufficient amount of exhaust gases are produced. Less efficient, since it demands extra power. More efficient, as it draws it's power from the exhaust gases. Superchargers cost less. Turbos are costly. Easy maintenance. Difficult to maintain, since lot of heat gets generated & also needs frequent lubrication. No lag, Power delivery is immediate. Turbo takes time to spin up to speed. Hence, there's a lag. Greater acceleration could be achieved. Higher speeds could be achieved. What are Superchargers ? Working, types, advantages & disadvantages ! Difference between 4 stroke & 2 stroke engine !